This is the second of a two-part series exploring metadata. Read part one. In last week’s article, we discussed what metadata was. This week, we’ll give you a step-by-step guide to properly add metadata and descriptive information to your digital photos. 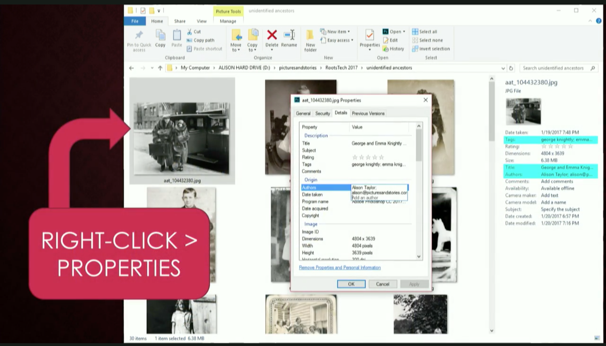 In her RootsTech 2017 presentation, Allison Taylor, founder of Pictures and Stories, explained how to add metadata to your photos using Microsoft and Apple devices. We’ve compiled her suggestions here. 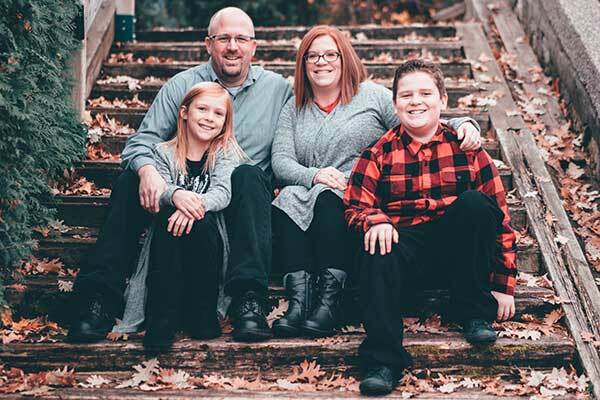 The names of people in the photo. The time period or year the photo was originally taken. The unique aspects of clothing people are wearing in the photo. It’s a good idea to describe the photo in a way that you’ll remember in the future so when you’re searching through the photos, it’s easier to find. Title: Tags may overlap with your title sometimes, but adding a title will help you and others know what’s happening in the photo. How Do I Add Metadata Using a Windows Computer? 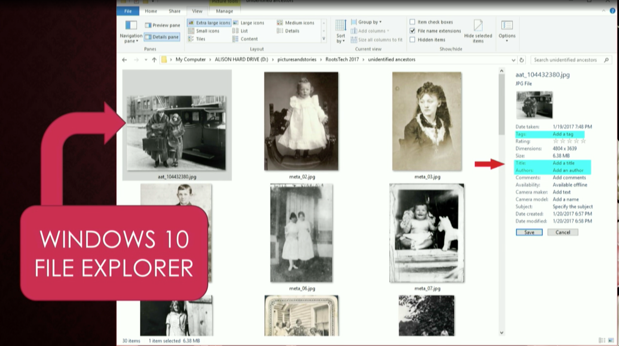 If you’re using Windows 10, there are a few ways to add metadata to your photos. We’ll describe each of them here. 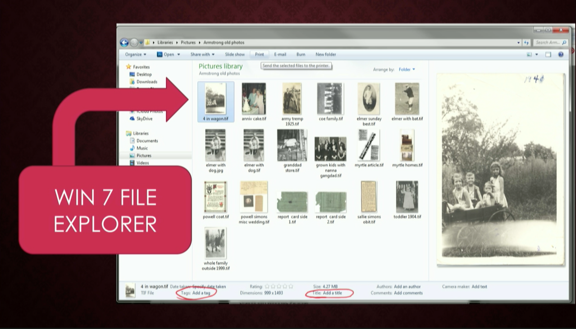 Open the folder containing your digitized photos. 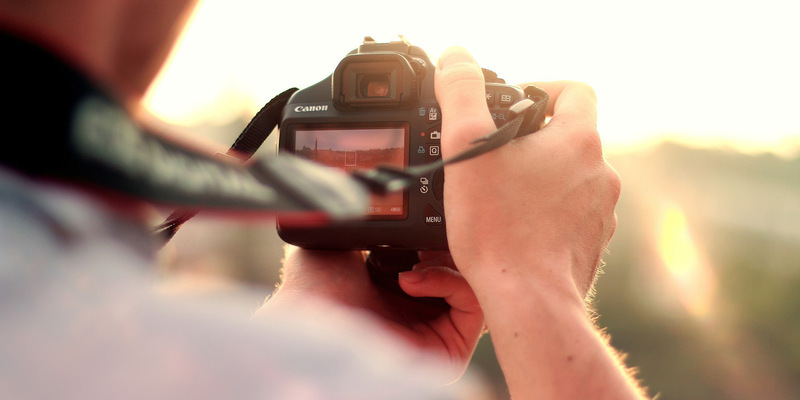 Select the photo you want to add your metadata to. Click the View tab at the top of the ribbon. In the details pane on the right side of the page, add things like a tag, title, and author. Right-click on the photo you want to add metadata to. In the window that opens, select the Details tab. Click the field next to the section where you want to add metadata. Select the photo you want to add metadata to. Right-click where it says “tags, title, author” at the bottom of the page. Click next to the field you want to add metadata to, and type in the metadata. How Do I Add Metadata Using an Apple Computer? 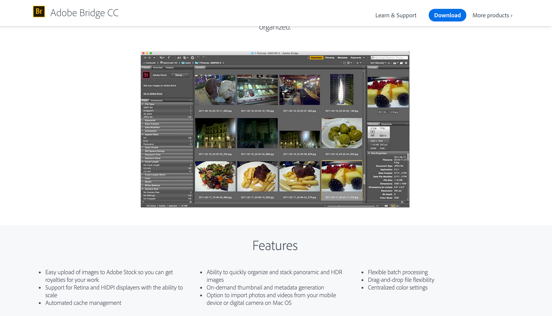 Metadata can’t be as readily added to a Mac as it is with Windows, so Taylor recommends using a third party software such as Adobe Bridge. 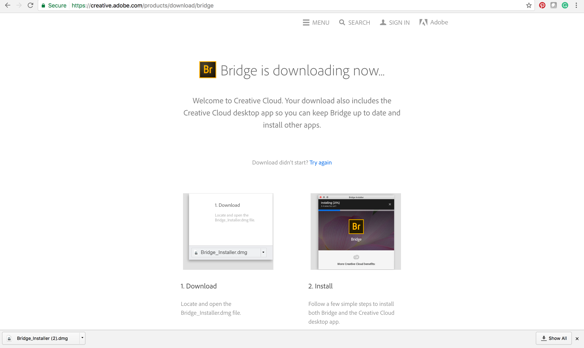 To download Adobe Bridge, click Download on the top right corner when you’ve entered the site. You will then be taken to another screen and have the option to open Bridge Installer. From here, double click the icon to install the program, then follow the prompts. Once you have downloaded the program, follow the step-by-step tutorial Taylor gives on how to use Adobe Bridge to add metadata. What tips do you have for using metadata? Tweet us @RootsTechConf with your ideas.